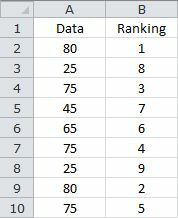 The formulas in the following examples return a unique ranking for a number in a list of numbers. In the first example, the numbers are ranked in descending order, whereas the numbers in the second example are ranked in ascending order. Based on the sample data, the formula returns the values in B2:B10.